University of Chicago Press, 9780226424385, 304pp. A year in Paris . . . since World War II, countless American students have been lured by that vision—and been transformed by their sojourn in the City of Light. Dreaming in French tells three stories of that experience, and how it changed the lives of three extraordinary American women. Kaplan takes readers into the lives, hopes, and ambitions of these young women, tracing their paths to Paris and tracking the discoveries, intellectual adventures, friendships, and loves that they found there. For all three women, France was far from a passing fancy; rather, Kaplan shows, the year abroad continued to influence them, a significant part of their intellectual and cultural makeup, for the rest of their lives. Jackie Kennedy carried her love of France to the White House and to her later career as a book editor, bringing her cultural and linguistic fluency to everything from art and diplomacy to fashion and historic restoration—to the extent that many, including Jackie herself, worried that she might seem “too French.” Sontag found in France a model for the life of the mind that she was determined to lead; the intellectual world she observed from afar during that first year in Paris inspired her most important work and remained a key influence—to be grappled with, explored, and transcended—the rest of her life. Davis, meanwhile, found that her Parisian vantage strengthened her sense of political exile from racism at home and brought a sense of solidarity with Algerian independence. For her, Paris was a city of political commitment, activism, and militancy, qualities that would deeply inform her own revolutionary agenda and soon make her a hero to the French writers she had once studied. Alice Kaplan is the author of French Lessons: A Memoir, The Collaborator, The Interpreter, and Dreaming in French: The Paris Years of Jacqueline Bouvier Kennedy, Susan Sontag, and Angela Davis, and the translator of OK, Joe, The Difficulty of Being a Dog, A Box of Photographs, and Palace of Books. Her books have been twice finalists for the National Book Critics Circle Awards, once for the National Book Award, and she is a winner of the Los Angeles Times Book Prize. She holds the John M. Musser chair in French literature at Yale. She lives in Guilford, Connecticut. "The #1 nonfiction book to look out for this spring." "An enduring group profile of three influential yet completely different American women, for each of whom Paris played a short but transformative role, over three tumultuous decades. . . . The much-admired Kaplan focuses sharply on three women of successive generations, providing a keen feminist-cultural picture of Paris’s enduring, if varied, impact." "A fascinating group portrait of three different women from three different generations whose trajectories nevertheless converge in one surprising yet significant place: Paris. 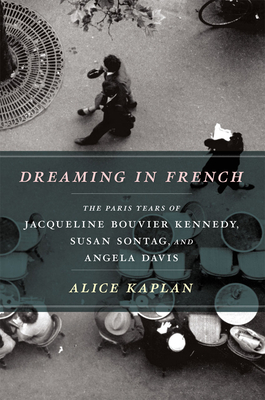 In this lively, original biographie à trois, Alice Kaplan shows how time spent living in the French capital and learning about its culture gave each of these sui generis heroines 'her own ideas of what counted'—and how those ideas in turn became an indelible part of the American political and cultural landscape." "An eloquent, brilliant, and often moving portrayal of three remarkable women whose personal and intellectual engagement with France transformed them, and by extension America as well. These intimate narratives of Jaqueline Kennedy, Susan Sontag, and Angela Davis feel not only vital, but also necessary to our understanding of their moral, aesthetic and political development, and just as importantly, to our understanding of each as a remarkable, flawed, and complicated human being." "Alice Kaplan's triple portrait of three iconic mid-century American women, dazzles beyond our evergreen fascination with the wildly disparate lives of Jacqueline Bouvier, Susan Sontag and Angela Davis. Her lens--the 'junior year abroad'--proves to be a brilliantly revealing cultural magnifying glass. With her meticulous scholarship, a novelist's gimlet eye for detail and the sheer grace of her writing, Kaplan has given us an original and now essential model of that enduring American narrative--the American in Paris." "Superbly perceptive. . . . Kaplan is a master at . . . selecting just the right aspect of everyday experience to illuminate an important point she wants to make. . . . Some books are well-written on a sentence-by-sentence basis; you leaf back through the pages to find you've underscored choice lines. Dreaming in French is the sort of book where you (well, I) draw vertical lines next to entire paragraphs. Kaplan produces some exquisite lines, yes, but she is positively incandescent on the level of thoughts and observations." "Lively. . . . The links Kaplan makes between these cultures and these women deliver fascinating insight to the conditions and changes surging through not only these particular lives, but those of Americans in general." "Gossip is one of the key pleasures--but far from the only one--to be found in Alice Kaplan’s absorbing new book. . . . It's a book, to some extent, about the desirability of abandoning or attenuating one’s Americanness." "Dreaming in French is, in essence a collection of three short, stand-alone biographies. But Kaplan is a talented historian, journalist, and storyteller, and so she's crafted a book greater than the sum of its parts. . . . An informative, well-written work of biographical nonfiction." "An elegant and entertaining work." "In this well-written triple biographical bite of a magical time in the lives of three ambitious women, Alice Kaplan plumbs the cultural vein that enticed a debutante, an intellectual and a political activist to the same smoky streets of Paris." “Kaplan admirably lets the three women often speak for themselves, through interviews, diaries or autobiographies. The portions on Bouvier are the most fun." "'We will always have Paris': Bogart's classic line from Casablanca could easily be applied to the three American women woven into a highly original triple micro-biography. Beyond their nationality, what could Jacqueline Bouvier Kennedy, Susan Sontag, and Angela Davis have in common? Each of them spent a year studying in Paris and left the city transformed by it. Documented and written like a novel, this womanly and erudite walking tour is as gratifying as a Woody Allen movie set in Paris." "Kaplan follows these women's singular trajectories in lively and brilliantly lucid prose."